Commentary on the Illuminatiam book. Rabbi Ba’al Shivah on Stalking and Shamanism. I WOULD LIKE TO THANK LON MILO DUQUETTE FOR POSING FOR THIS PICTURE AND THE PERMISSION TO USE IT FOR THIS PIECE AND I WOULD LIKE TO THANK LYNN MARIE LE FOR TAKING THE PICTURE AND OBTAININING THE CONSENT. Since the dawn of mankind there have been 3 different types of major totems for witch doctors, holy men, shamans, and seers. The lion, the bull and the eagle. We are here today to talk about the lion especially as a symbol for predatory cats. People who study the human brain know that there are different types of intelligences. One of the more common analogies for describing different but highly functional mentalities is the comparison of the fox and the hedge hog. Richard Feynman was referred to as the fox because his way of understanding things that nobody else could, and wrapping his mind around them. Einstein was referred to as the hedgehog because of the way he could humbly edit his consideration set and burrow his way towards the answer and ferret it out. Richard Feynman was the guy that figured out how the space shuttle Columbia blew up and he had to explain it very slowly and deliberately to other people who didn’t believe him and couldn’t understand his brilliance and the fact that he was correct. The reason that I bring this up is that for shamans being philosophers the way they hold a question in their mind and follow its sent was symbolized by the ancient super-genii as a stalking cat. A predatory cat stalking it’s prey. 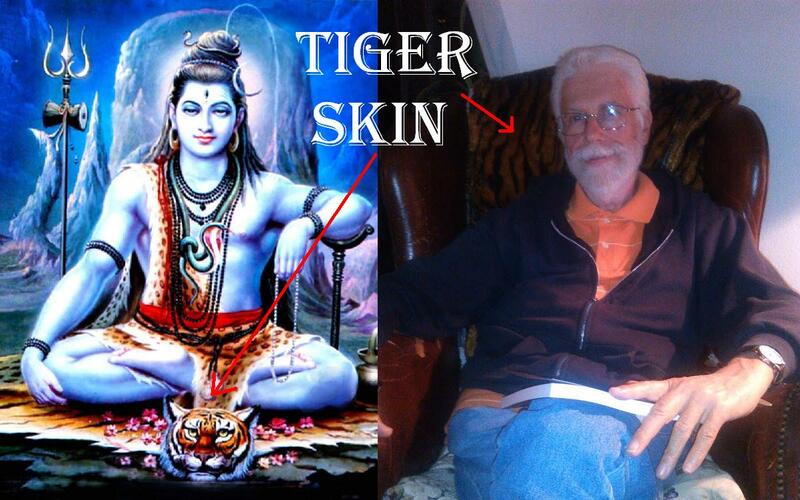 This symbolism was universal and one particular cult is marked by their use of the predatory cat skin. Even though priests, it did not mean serving their god would mean just approaching and proclaiming themselves as priests. They washed themselves several times per day to eliminate off all the body hair to be untainted enough to approach the god. Because of being cleansed to approach the god, they did not wear leather sandals or wool clothing, as it was considered unclean. When serving the god Amun, they would wear leopard skin robes. In many cults, also known as churches, they did not wear a wig as all men and women wore. 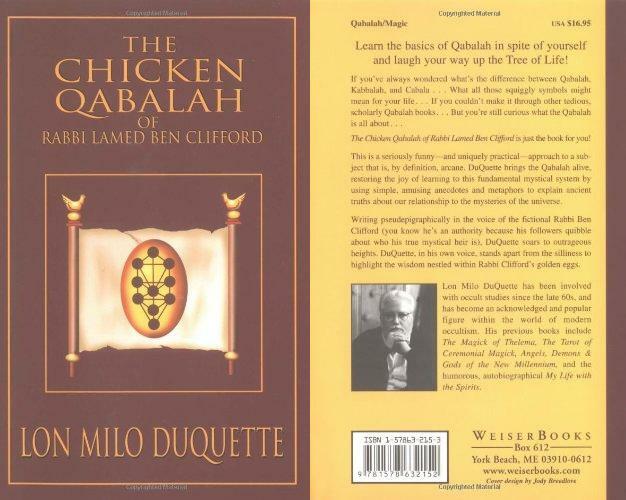 In his book The Chicken Kabbalah, Lon mentions having a rabbinical experience in his cat skin skirt demonstrating the continued theme from Egypt into Occult Judaism, but this metaphor goes back even further all the way to India and Shaivism. 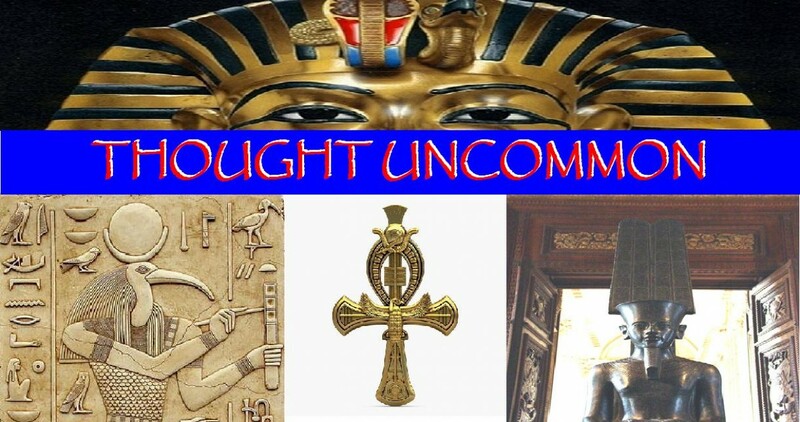 If you are familiar with my theory on the Origins of the True Religion, you will see how consistent this theme is and how many questions it answers. 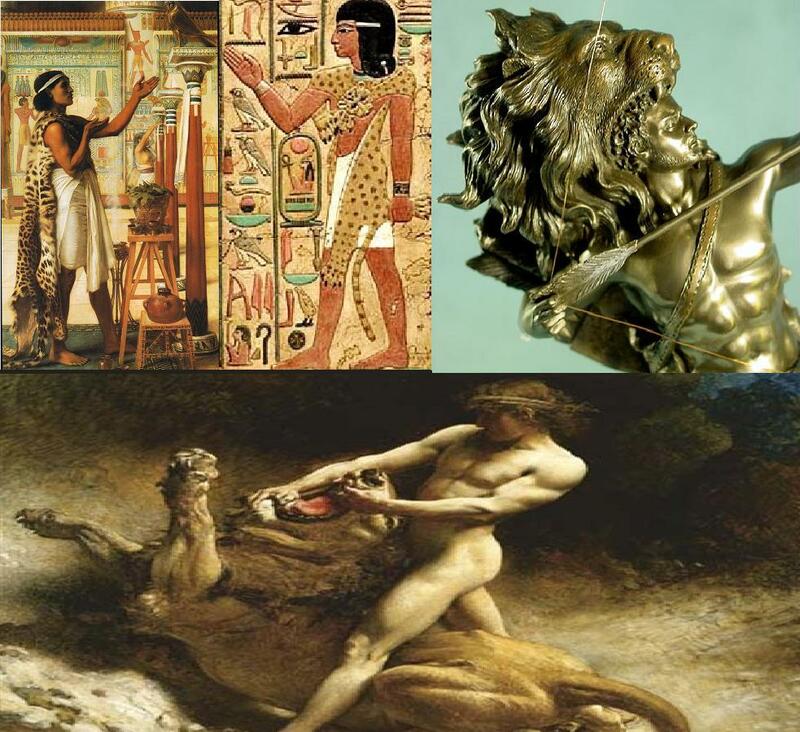 The first task of Hercules whose name itself is a deviation of Horus the sun god, was to kill the Nemean Lion. Having done so he wore the skin, in a way becoming the sun. Remember that in astrology, the lion represents the sun. This is also were the soul enters the zodiac, from the ancient perspective the soul split itself into male and female before incarnating in the zodiac. The sun and moon are the only two planets that don’t repeat as rulers of two houses (in the original 7 planet horoscope). The 12 labors of Hercules are the sun moving through each house and understanding the trials in that house as the soul (sol,sun) perfects itself and learns its lessons through struggle, trial and tribulation. The Rosicrucian initiation process uses Hercules as a model to this day. Samson, in the Bible is actually Hercules as well who is also shown above killing a lion. Samson is also named after the sun with a word that derives from Persian. In Taoism the Yin and Yang symbols are associated with the tigress and the dragon. The tigress represents earthly power or success, while the Dragon represents the masculine and heavenly element. 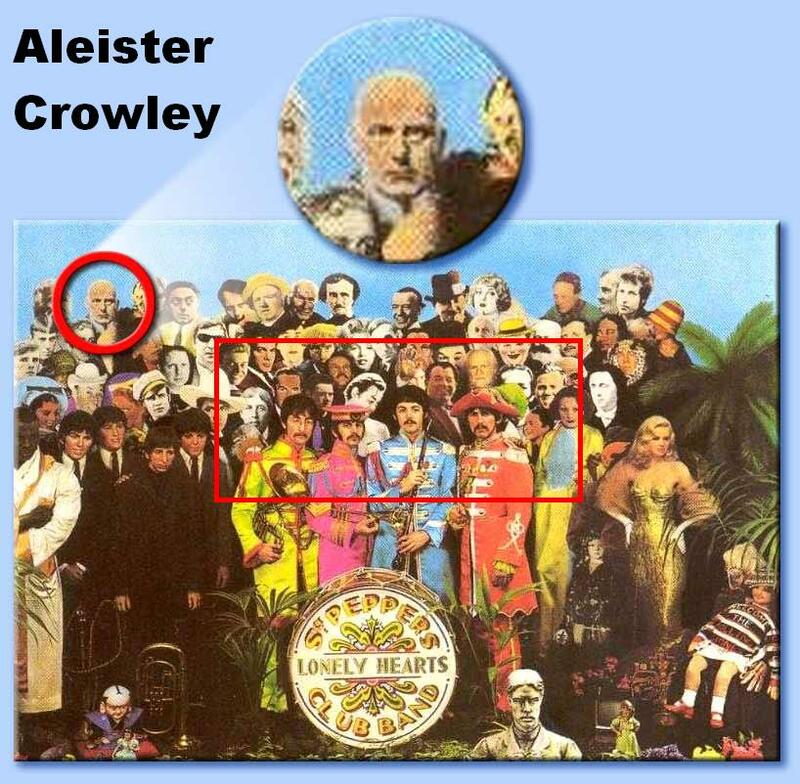 Remember that the symbol for the Ankh is a metaphor for heaven and earth, the male and female symbols juxtaposed, and Thelema, the religion started by Aleister Crowley is the western version of Taoism from an original authentic living guru lineage. It is the philosophical connection that rationalizes the philosophical systems from all over the world. In the Osho Zen tarot Bhagwan Shree Rajneesh demonstrates his understanding of the same principle, remember he was also known as the Rock and Roll Guru. Well I think that is all the dots I am going to connect for you today. I hope you have enjoyed that little romp through time and across continents and have arrived at a deeper understanding. Oh yeah, if you want a little more I have included a story that explains how the leopard got its spots from the ancient perspective, not factual but allegorical. always posing as the Truth. But Anubis was able, by means of his keen canine senses, to sniff out Seth in whatever form he takes. Once, Seth assumed the form of a leopard and blended into the desert sand so well that Horus was unable to spot him from the air as he circled high in the sky upon his falcon wings, using his sharp falcon eyes to scan the Earth. But Anubis sniffed out Seth and decided to brand him so that everyone would be able to see him. 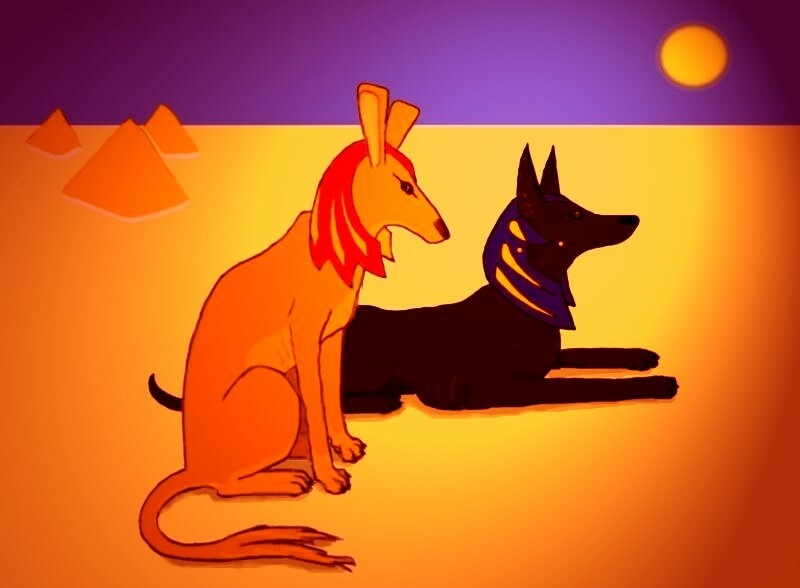 Anubis trotted over to the banks of the Nile and dunked his paws in rich black Nile mud. Then he lept onto the leopard and left indelible muddy paw prints all over Seth’s hide. That is how the leopard got its spots, according to the Ancient Egyptians. The highest caste of Egyptian magician/priests wore leopard skins to symbolize the never-ending struggle between the Truth and the Lie. The Lie persists. Seth the Deceiver was not killed by Anubis. But Anubis revealed Seth for the Lie that he is. And that is why the Priests at the Great Temple of Antinoopolis may have worn leopard skins — to demonstrate that it is possible to see through the Lie to uncover the Truth that lies underneath.